By now you all know that I have a thing for makeup brushes.. Not just a thing, but a seriously overspending kind of why-do-I-even-have-this-many-brushes thing. 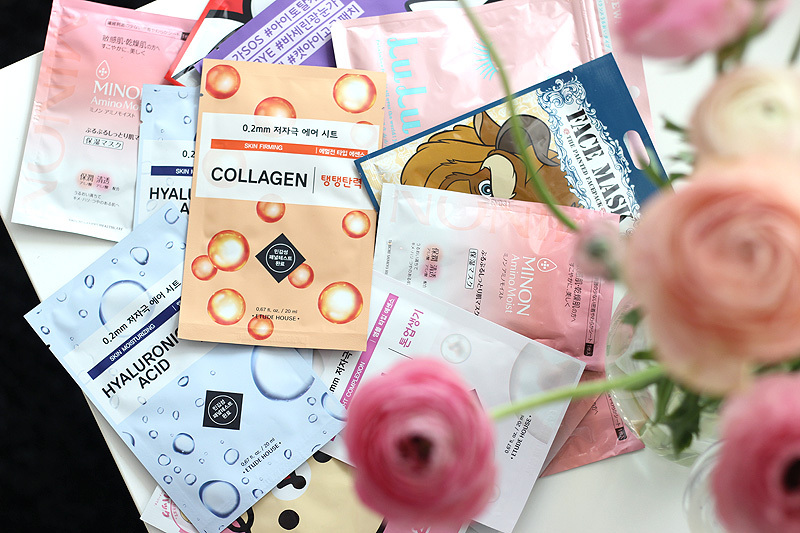 They're my weak spot in makeup because they don't expire, can transform a product you're using and are the perfect little luxuries to treat yourself to whenever you feel like it. 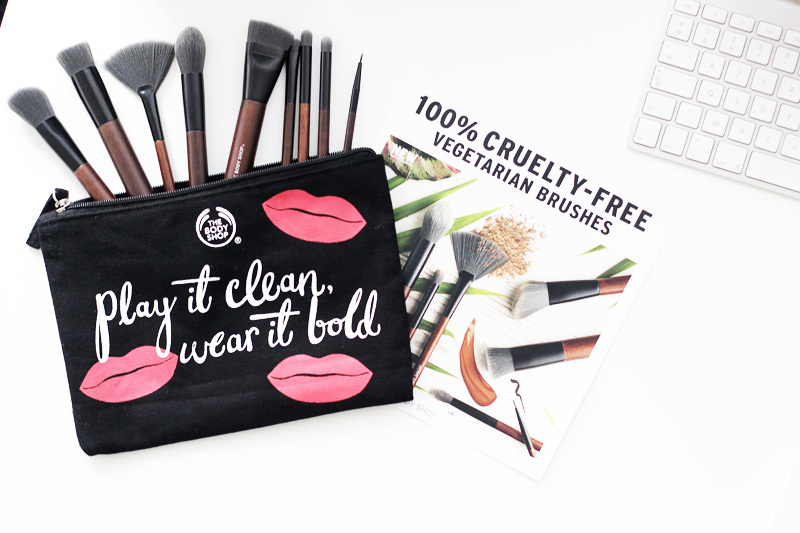 There's a lot to be said about whether or not you should be using only vegan brushes, but I don't want to get into that discussion here. I do however want to talk about the new vegan brush line that The Body Shop is offering to those of you who do feel strongly about going 100% vegan in your brush collection. 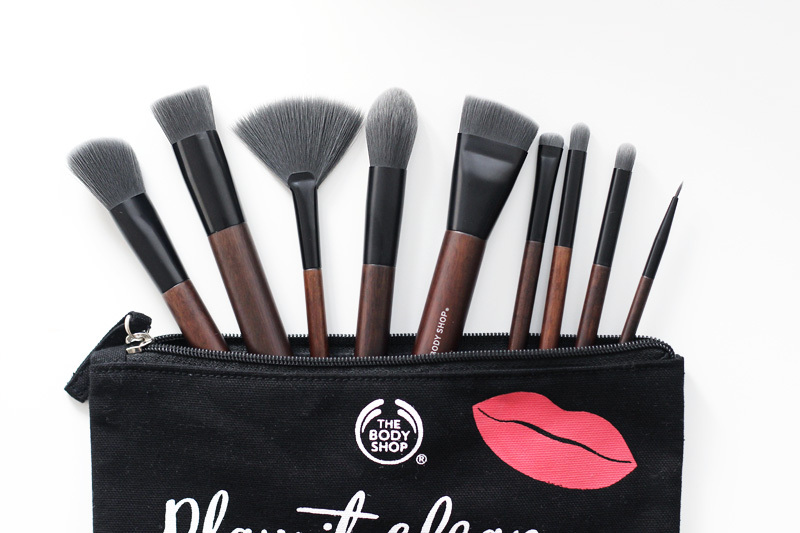 The collection consists of nine brushes and one brush cleanser tool. 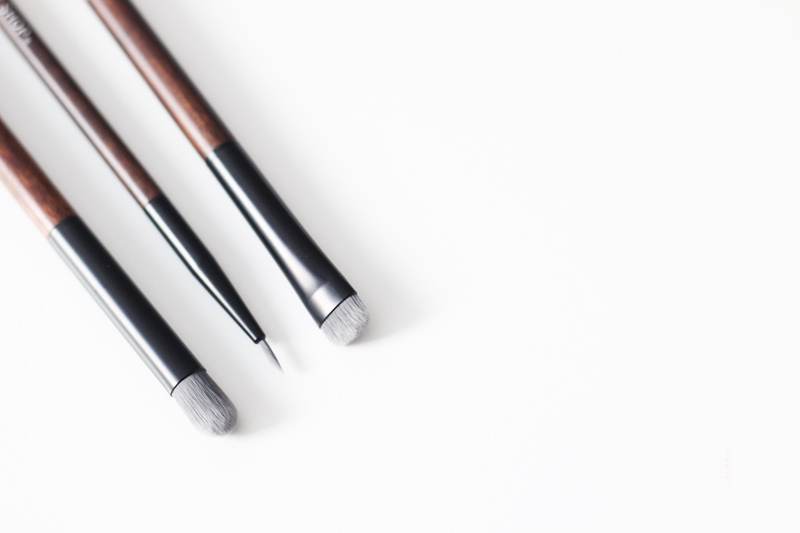 For the eyes there's a good basic offering of all that you need to achieve a basic eye look: a blending brush, a smudging brush, a crease brush & an eyeliner brush. Perhaps a flat shader brush would've been a great addition to apply your lid colour, but if you really want to stick to this selection you could use the crease brush instead too. 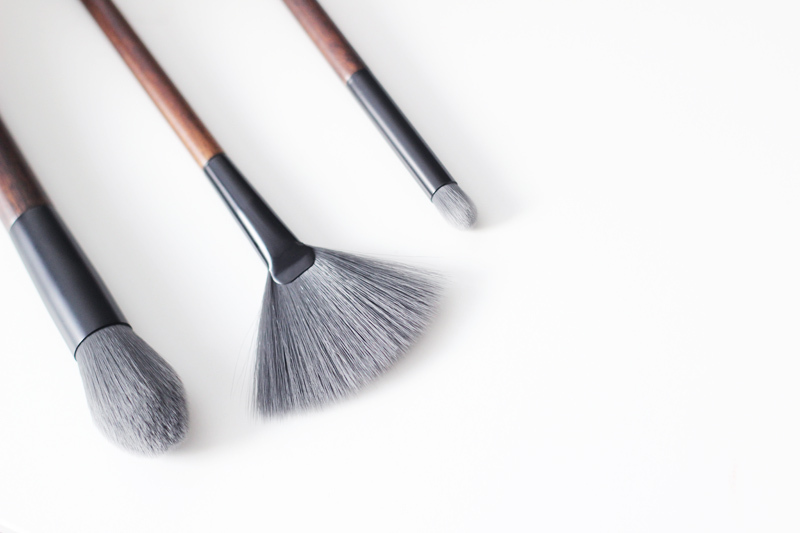 For the complexion there's a basic selection too: a fan brush, a pointed highlighter brush, a buffing brush, a slanted blusher brush & a contouring brush. All brushes have 100% synthetic bristles & the wooden handles have also been ethically sourced. I received nine brushes to review, although there has been a small mix-up which resulted in me getting a second eyeshadow crease brush instead of the eyeshadow blending brush. I do have enough blending brushes in my collection right now, so I haven't gone out to purchase it for this review.. The contouring brush (left) is a dense and stiff angled brush that is perfect to apply cream contour products with in the hollows of your cheeks. I didn't really like it for powder application though, as it didn't have enough movement to blend powder with so it doesn't just look like one harsh streak of powder contour. Retails for €16.00. 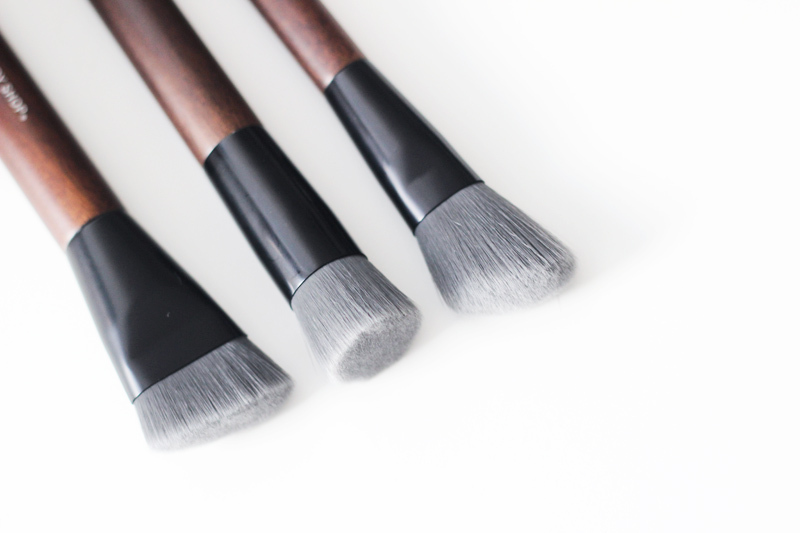 The buffing brush (middle) is a semi-dense foundation brush that should be used to buff in liquid foundation in circular motions. It is not my favourite way of applying foundation (I doubt I'll ever like anything as much as I love my Artis oval brush), but if you love using a buffing brush than this one is a decent choice. Retails for €16.00. The slanted blusher brush (right) is a soft blush brush with an angled cut that is very pleasant to apply blush with. 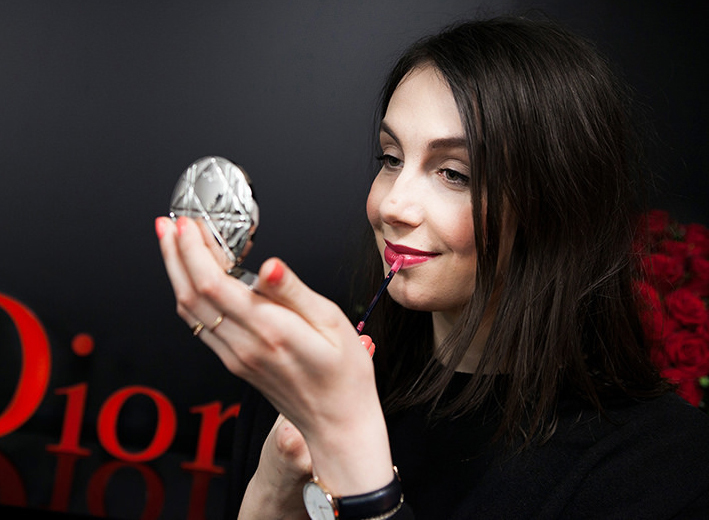 It picks up the right amount of powder and applies it softly and evenly on the apples of your cheeks. Retails for €14.00. The pointed highlighter brush (left) is a pointed brush that is intended to use for highlighting your complexion. While it does work, I still like my highlighting brushes a little less dense so it distributes product a little softer. Retails for €14.00. The fan brush (middle) is the real star here for highlighting: it's pretty much perfect for it! This is a very thin wide brush that'll very subtly apply powder. The size and width is perfect for highlighting and ensures a very natural looking finish. Retails for €13.00. The eyeshadow crease brush (right) is a densely packed rounded eyeshadow brush that is designed to apply eyeshadow to the crease with. It doesn't really have much movement and picks up quite some product, which results in a very pigmented deposit of eyeshadow. The eyeliner brush (middle) is a very fine brush designed to apply cream or fluid eyeliner with. This is actually my very favourite type of brush to apply cream eyeliner with as I first learned how to line my eyes with these type of brushes. Retails for €10.00. The smudging brush (right) is a wide & dense eyeshadow brush that is just about perfect to apply eyeshadow with underneath your lower lash line. You can also use it to smudge out eyeliner for a smokey effect. A staple in my brush collection! Retails for €10.00. I've been pretty impressed about these brushes while using them. There's no shedding (a big plus! ), the bristles are soft but still pick up the right amount of product & they all seem to do their job pretty well - although of course some I'm more convinced about than others. The main thing I'm still missing is a bigger assortment of brushes: I'm missing a flat eyeshadow shader brush, a concealer buffing brush, a duo fibre foundation brush, a big powder brush, .. And while the makeup world is still crazy about oval brushes: perhaps it might be a good idea for The Body Shop to also jump on that bandwagon as well? They'd surely have a good customer in me!